Our thanks go to Tsveta Rafaylova for writing this review. Tsveta is a Research Librarian Assistant at the accountancy firm RSM and is also studying part-time on the Library and Information Studies course at UCL. The SLA Winter Warmer Quiz, one of the staple quiz events of the year, took place on 29th of January. 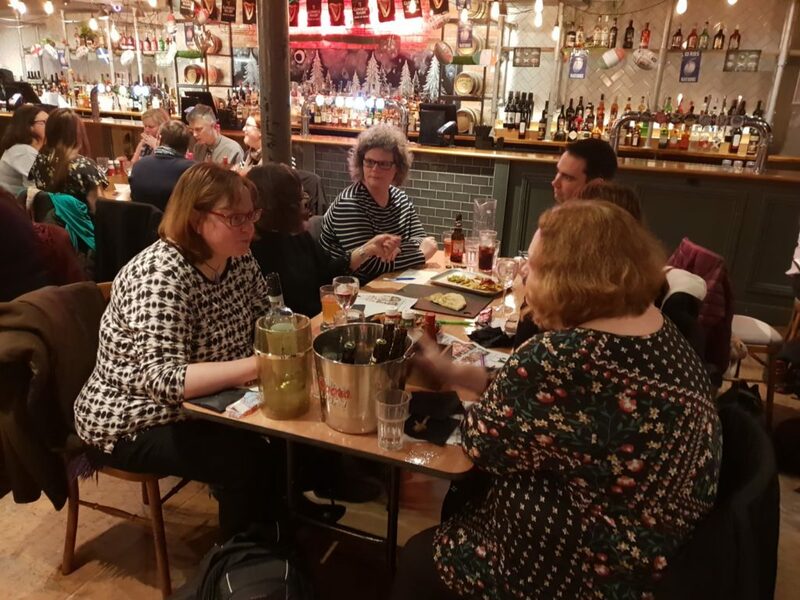 For the second year running, the quiz was hosted in O’Neill’s in Wardour Street and this year fifteen teams took refuge from the rain and the cold by participating in the quiz. The night started off with a warm welcome from the current president of SLA Europe, Simon Burton, who enthusiastically outlined the year ahead for the European chapter and highlighted the upcoming in March career stories event. Simon’s introduction was followed by a quick word from the SLA president himself Hal Kirkwood who was similarly excited to engage with and receive more input from the European chapter. Dann, the mike was handed over to Abbi from Quiz Quiz Quiz and so the night of quizzing began! First up, with an intriguing use of visuals, was the ‘Spin the wheel’ round. On screens around the room teams could see the first letter of the answer to each question as (and you guessed correctly) the wheel span round. While you may think that having the first letter guarantees an easier answer, it turns out that isn’t always the case and there were a few particularly slippery questions. The remaining rounds similarly avoided the usual subject-based quiz round structure. Stattdessen, the questions tested the teams’ knowledge of John Lewis Christmas ads, paperback book covers and TV show opening scores, among others. A break for some tasty pub food also gave the teams a chance to finish off their picture rounds before moving on to the last three rounds of the quiz, during which we were treated to a visit from James Bond and the Queen! Sadly not in person, only in video, but I think we can all agree they would make good SLA members, if they had only accepted their Eventbrite invite. Insgesamt, a question that stood out for me was a brain teaser that two of my colleagues were very proud for getting right. When fully written out, which is smallest number in which all five vowels appear only once? Answer provided below. It turned out to be a very close quiz, with the top nine teams each separated by one point. Letztlich, Skill’d lived up to the promise of their team name and deservingly won first place with a total of 82 Punkte. Close behind, haunted by a decision not to put breaststroke as the slowest swimming style, came my team, At least we’re not the Royal School of Medicine. At third place and with one of the best pun team names of the night were Love Actuary, while the wooden spoon was received by Chip and Dip, coincidentally the team of SLA Europe’s president! 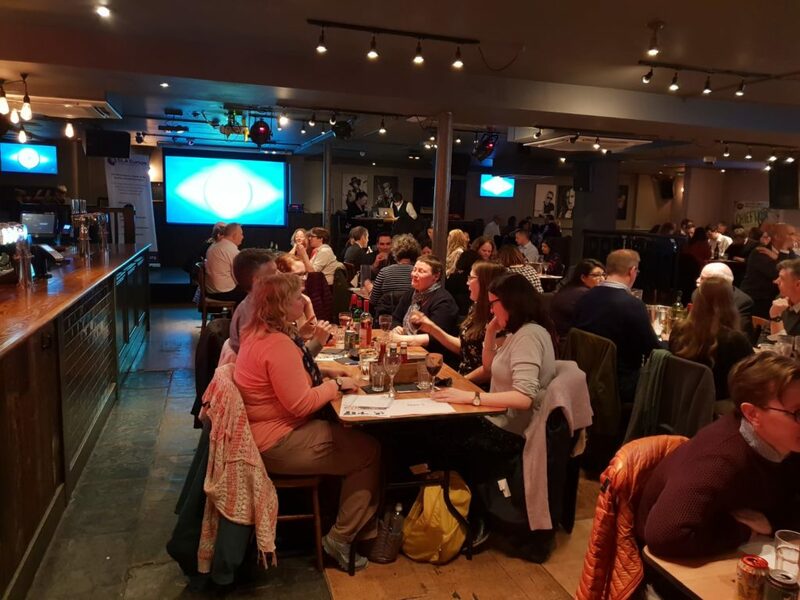 This was my second Winter Warmer Quiz and as a young professional I particularly enjoy the opportunity to engage more with the professional community and the SLA Winter quiz provides the perfect opportunity to meet new people and share knowledge. Speaking of sharing knowledge, here is the answer I promised to share earlier: the smallest number without duplicating vowels is two hundred and six. And if you found this question straightforward, please join us for next year’s quiz! A point makes all the difference, after all. 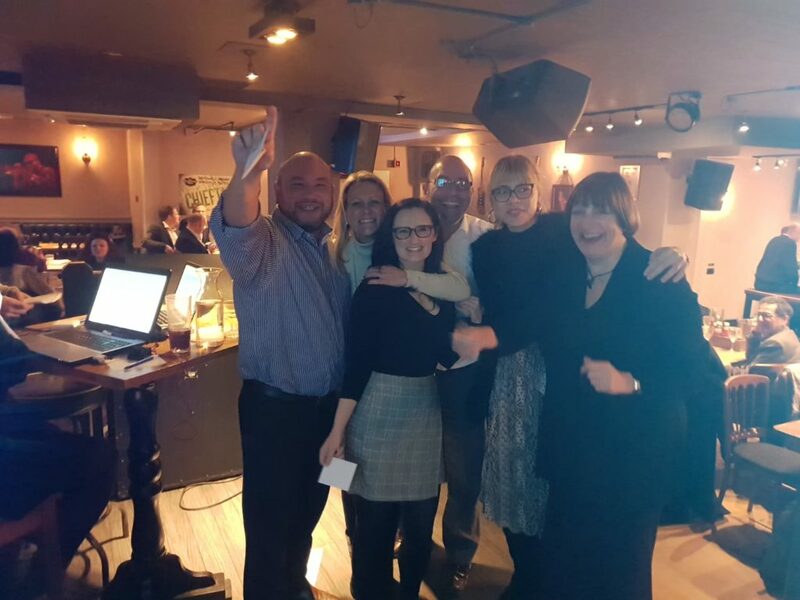 Thanks to the Events Committee for organising a great evening, to all the attentive staff at O’Neills and to Abbie Jones and team at QuizQuizQuiz for a great quiz. SLA EUROPE,nl 2019 KONFERENZ,,en,RESERVIEREN SIE DAS DATUM,,en,Bibliothekskonferenz,,en,LIS-Konferenz,,en,SLA Europe Konferenz,,en,Vielen Dank an alle, die im letzten Oktober zu unserer Umfrage beigetragen haben und Kommentare zu den Plänen für die allererste SLA Europe Conference einladen. Glückwunsch an Michelle Bond, die glückliche Gewinnerin der Auslosung der Antwortenden,,en,Michelle gewinnt 30 £,,en,Ihre Antworten waren sehr hilfreich, um unser Denken über diese Veranstaltung zu informieren,,en – RESERVE THE DATE!